A very small utility pump that fits smaller fountains and aquariums and is an ideal replacement pump for many small fountain pumps. 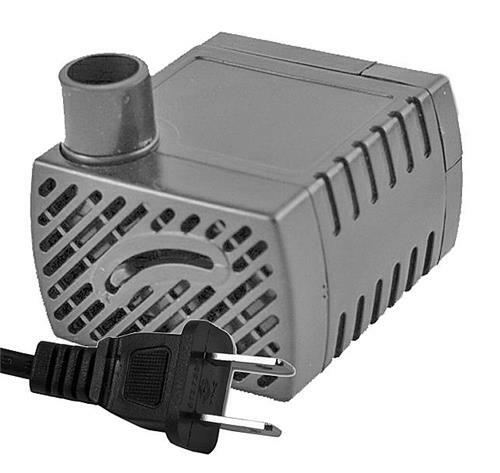 This compact pump features a low profile design and will pump in just 1/2 inch of water. The intake is fitted with a slide flow control to adjust flow. The unit has 3 small suction cups on the base for cushioning and noise suppression. One (1) year warranty. This pump is a suitable replacement for Alpine, Fountain Pro, Ocean Mist, Jebo, Peaktop and many other brands of small fountain pumps. Q: Is this pump comparable to the Rena Flow 300? Trying to find a pump to replace for small water fountain. Not sure what a 2-wire is. My pump has attached elctric cord whic plugs directly into the wall. Thank you. A: This is a thin cord with two prong (2 wire) plug. As opposed to other pumps we sell with a 3-wire cord and plug with grounding pin. Other models with a thin cord are the Low-Voltage units but they plug into a transformer that plugs into the outlet. The Rena model you reference is either the RF300C two-wire non-grounded cord or the RF300S three-wire grounded cord.